Have you heard? Did you see anything? What’s happened to Jack? These are the questions Jack In The Box is trying to get us to ask. With one Super Bowl commercial, depicting their CEO/mascot Jack getting hit by a bus, his iconic yellow hat thrown to the ground, his round, golf ball-like head cracked, his pointed nose in shambles, one thing is clear: Jack in the Box has gone viral. Now what the campaign is trying to promote isn’t clear. The commercial sets us up, piquing our interest — but it doesn’t give any explanation. Instead, the final frame of the commercial directs you to www.hangintherejack.com. A second commercial has aired since — of Jack heading into surgery. Needless to say, after seeing these commercials at least once a day for the past week, I was curious. So with the click of a mouse, I was whisked away to the world of fast food-meets-viral marketing. At first glance, the website looks like a blog (and in fact, it is). But they are really getting into the story. 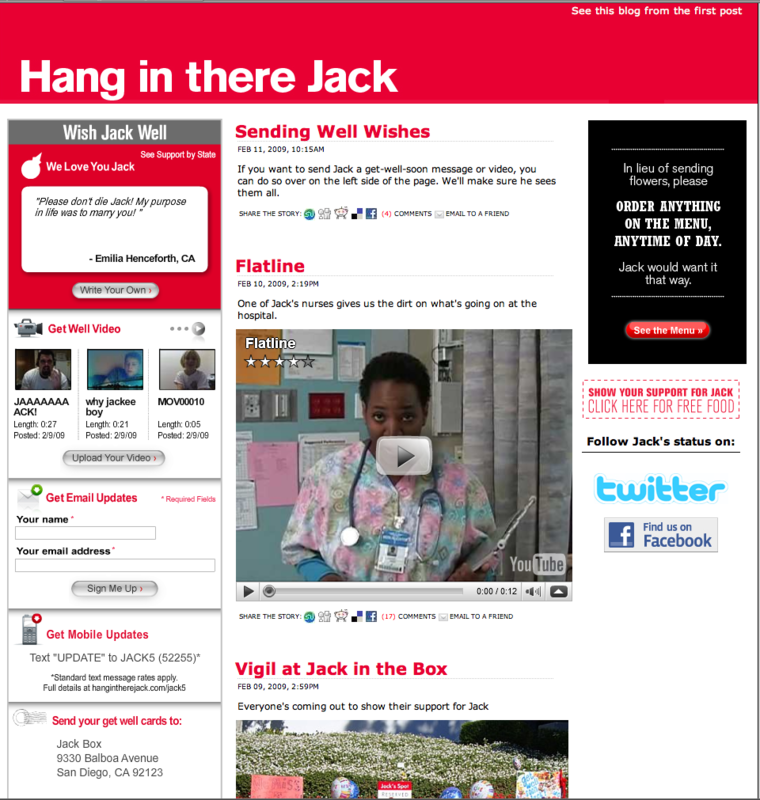 The header reads, “Hang In There Jack,” there are “Wish Jack Well” posts and videos from various users. You can sign up for email and mobile updates on Jack’s status, send get well cards via snail mail. Finally, there are YouTube video entries posted daily from Jack in the Box officials, Jack’s “doctors”, and the paramedics and “witnesses” from the scene of the accident giving statements and reports. One post explains that photos from the scene were “found” on flickr. And of course, you can follow along via Twitter and Facebook. Whatever JitB is up to, if you look at the success of previous viral campaigns, they’re on the right track. Many other companies and movies have utilized viral marketing campaign successfully. In 2004, Burger King introduced “The Subservient Chicken”, an advertising program created to promote Burger King’s TenderCrisp chicken sandwich and their “Have it Your Way” campaign. The program featured a viral marketing website, TV, and print campaigns, plus a one-time pay-per-view program. In 2007, Transformers movie-goers saw an enticing teaser trailer for a movie — but the only details they got on the film were the name of the production company (J.J. Abrams’ Bad Robot productions) and the release date — 1-18-08. What followed were numerous Google searches on this mysterious movie, fanatic blogs, and massive speculation. Was it a spin-off of Lost, another J.J. Abrams creation? Was it a new film about Godzilla? But for months, the movie’s creators never gave anything away. And with that, the viral marketing campaign got into full swing. Puzzle websites popped up that claimed to be a part of the film. The movie’s official website, 1-18-08.com, featured a collection of time-coded photos — their meaning was to be interpreted and pieced together by visitors. Eventually, the name was released: Cloverfield. In one of the last aspects of the viral campaign, MySpace pages were created for the movie’s fictional characters, and websites were created for the fictional companies referenced in the film. Cloverfield was viral marketing at its finest. The movie saved countless dollars on advertising — because they didn’t need it. 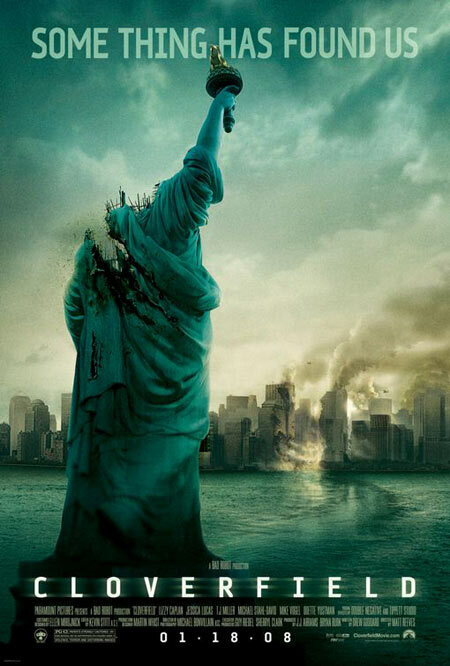 By leaking little bits of information, they had created a massive word-of-mouth marketing campaign so great, most theaters were sold out on opening weekend and the weeks that followed, all anyone did could talk about was Cloverfield. With the economy in a deep recession, and companies looking for more economical methods of marketing, consider alternatives like viral marketing. With the right product, concept, and plan, it can be extremely cost-efficient and generate serious buzz — more than you’d get with plain old print ads. Don’t believe me? Just ask Jack. Viral is effective because it’s considered a word to mouth form a friend or acquaintance reliable recommendation and not seams to be a sale made by the product/service owner. That boost the effectivness of the campaign in 100’s percents more and get’s much more exposure.